It is not often that I try something and want to eat the whole lot of them! I made a batch of these very tasty treats and Dave and I had to ration ourselves to making them last two days. This recipe for cinnamon buns was given to me by my friend Bev and I can lay no claim to it’s goodness. You would do well to make double the batch and cook the second batch as soon as you take the last one out of the container you have hidden them in. I am going to save these for a weekend tea time treat, as if I make them for after dinner dessert during the week, my waist line and I will soon not be on the same page. These are looking delicious!! Thanks for the recipe! You are such an inspiration! enjoy trying them, and do let me know what you think! drool. these cinnamon buns look delish. Aah please can I have these if I ever get to come and visit? They look fabulous! Have a happy weekend. Have never even tried a cinnamon bun (why not, I ask myself?) 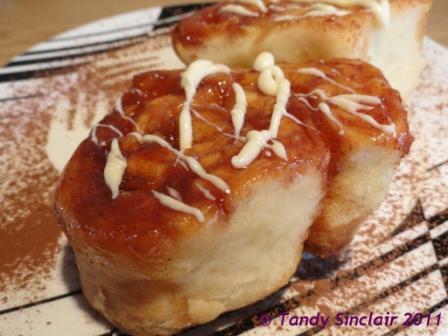 and I adore cinnamon, so I´d better hurry up and get on with making some!